The ultimate starter bottle in increasing your water intake! 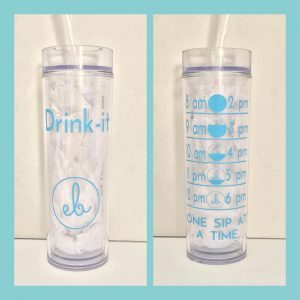 Our Drink-It™ features a unique timeline, measured to keep track of your daily water intake. This bottle holds 16oz of water, fits easily into your day bag and compatible with cup holders. The design of straw top makes it super easy to drink on the go. The unique design, durable construction and BPA-Free materials make this bottle ideal for any individual. Specs below. Printed vinyl 160oz double wall insulated acrylic tumbler made from the highest grade BPA free, the tumble is super durable and ideal for everyday use. The plastic push-on lid creates a super tight seal to prevent leaks and comes with a matching reusable straw with slip stopper.